The Bullseye Locations lead management module is an easy to implement lead capture and routing mechanism that is perfect for manufacturers, retailers, insurance companies, financial advisers, and other companies with a distributed sales force. Bullseye’s lead manager allows brands and manufacturers to get inquiries and requests quickly into the hands of the individual dealer, location, or distributor for faster follow-up and higher sales conversion. The hosted application and back-end provides a robust set of easy-to-use tools for customizing workflow, configuring emails, monitoring leads and reporting. 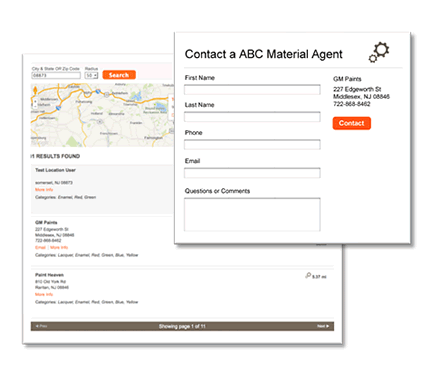 Integrates seamlessly with Bullseye’s dealer locator software using a built-in contact form. Fully configure and customize email templates including text, branding and merge fields. Integrate stand-alone lead forms that automatically assign locations via Zapier or our REST API. Automatically sends a customizable confirmation to the lead and sends a “you’ve got leads” email to the dealer or location. Provide dealers with account access to log in, retrieve leads, update lead status, manage location information and view dashboard reports. Built-in notification lets you know when leads are not assigned and lets you create manual assignments. Customize routing of leads based on radius, territory, categories, products, responsiveness, and many more options. Full reporting suite lets you manage and track leads by source, category geography, response status, response time, etc.